And he said unto them, Go ye into all the world, and preach the gospel to every creature. He that believeth and is baptized shall be saved; but he that believeth not shall be damned. And these signs shall follow them that believe; in my name shall they cast out devils; they shall speak with new tongues; they shall take up serpents; and if they drink any deadly thing, it shall not hurt them; they shall lay hands on the sick, and they shall recover. — Mark 16:15�18. Says Campbell�s translation, “These miraculous powers shall attend the believers.” The gifts were not confined to the apostles, but extended to the believers. Who will have them? Those that believe. How long? There is no limitation; the promise seems to run parallel with the great commission to preach the gospel, and to reach to the last believer. That the preaching of the gospel under this commission did not end with the primitive church is evident from the promise, “I am with you alway, even to the end of the world.” He does not say, I am with you, apostles, everywhere, even to the ends of the earth; but it is always, to the end of the world, or age. It will not do to say that the Jewish age is meant, for that had already ended at the cross. 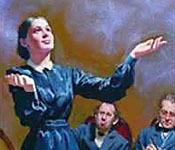 I conclude then that the preaching and the belief of the primitive gospel will be attended with the same spiritual aid. The apostles� commission belonged to the Christian age, and it embraced the whole of it. Consequently, the gifts were only lost through apostasy and will be revived with the revival of primitive faith and practice. They are to cease when that which is perfect is come�when we shall no longer see through a glass darkly, but face to face. The perfect day, when the just are made perfect, and see as they are seen, is yet in the future. It is true that the Man of Sin, when arrived at manhood, had put away such “childish things” as prophecies, tongues and knowledge, as well as the faith and hope and charity of the primitive Christians. But there is nothing in the text to show that God designed to take away the gifts which He had set in the church, till the consummation of her faith and hope�till the surpassing glory of the immortal state should eclipse the most brilliant displays of spiritual power and knowledge ever manifested in this mortal state. For I testify unto every man that heareth the words of the prophecy of this book, If any man shall add unto these things, God shall add unto him the plagues that are written in this book: and if any man shall take away from the words of the book of this prophecy, God shall take away his part out of the book of life, and out of the holy city, and from the things which are written in this book. — Revelation 22:18�19. From this text it is claimed that God, who at sundry times, and in divers manners, spake in time past to the fathers by the prophets, and, in the commencement of the gospel day, by Jesus and his apostles, hath hereby solemnly promised never to communicate anything more to man in that way. Hence all prophesying after this date must be false. This, say they, closes the canon of inspiration. . . . It is evident from the text, that the caution against adding to or taking from, refers not to the Bible as we have the volume compiled, but to the separate book of Revelation, as it came from the hand of the apostle. Yet no man has a right to add to or subtract from any other book written by inspiration of God. Did John, in writing the book of Revelation, add anything to the book of Daniel�s prophecy? Not at all. A prophet has no right to alter the word of God. But the visions of John corroborate those of Daniel, and give much additional light upon the subjects there introduced. I conclude then that the Lord has not bound himself to keep silence, but is still at liberty to speak. Ever be it the language of my heart, Speak, Lord, through whom thou wilt; thy servant heareth. Thus the attempt to prove from Scripture the abolition of spiritual gifts, proves a total failure. Again, we were forewarned that there would be false prophets in the last days, and the Bible gives a test by which to try their teachings in order that we may distinguish between the true and the false. The grand test is the law of God, which is applied both to the prophesyings and to the moral character of the prophets. If there were to be no true prophesyings in the last days, how much easier to have stated the fact, and thus cut off all chance for deception, than to give a test by which to try them, as though there would be the genuine as well as the false. In Isaiah 8:19�20 is a prophecy of the familiar spirits of the present time, and the law is given as a test: “To the law and to the testimony: if they speak not according to this word, it is because there is no light in them.” Why say, “if they speak not,” if there was to be no true spiritual manifestation or prophesying at the same time? Jesus says, “Beware of false prophets, . . . ye shall know them by their fruits.” Matthew 7:15�16. This is a part of “the sermon on the mount,” and all can see that this discourse has a general application to the church throughout the gospel age. False prophets are to be known by their fruits; in other words, by their moral character. The only standard by which to determine whether their fruits are good or bad is the law of God. Hence we are brought to the law and to the testimony. True prophets will not only speak according to this word, but they must live according to it. One who speaks and lives thus I dare not condemn. Prophesyings which contradict the plain and positive declarations of the Word are to be rejected. An example is given in the manner of Christ�s second coming. When Jesus ascended to heaven in the sight of his disciples, it was declared most explicitly by the angels, that this same Jesus should so come in like manner as they had seen him go into heaven. Acts 1:11. Hence Jesus, in predicting the false prophets of the last days, says, “If they shall say unto you, Behold, he is in the desert; go not forth: Behold, he is in the secret chambers; believe it not.” Matthew 24:26. All true prophesying on that point must recognize his visible coming from heaven. Now let us reason a moment upon this point. All these gifts were given for the perfecting of the saints in unity, knowledge, and spirit. Under their influence the primitive church enjoyed that unity for a time. “The multitude of them that believed were of one heart and of one soul.” Acts 4:32. And it seems a natural consequence of this state of unity, that “with great power gave the apostles witness of the resurrection of the Lord Jesus: and great grace was upon them all.” Verse 33. How desirable such a state of things now! But apostasy with its dividing and blighting influence marred the beauty of the fair church, and clothed her in sackcloth. Division and disorder have been the result. Never was there so great a diversity of faith in christendom as at the present day. If the gifts were necessary for the unity of the primitive church, how much more so to restore unity now! And that it is the purpose of God to restore the unity of the church in the last days, is abundantly evident from the prophecies. We are assured that the watchmen shall see eye to eye, when the Lord shall bring again Zion. See Isaiah 52:8. Also, that in the time of the end the wise shall understand. See Daniel 12:9�10. When this is fulfilled, there will be unity of faith with all that God accounts wise; for those that do in reality understand aright, must, necessarily understand alike. What is to effect this unity, but the gifts that were given for this very purpose? From considerations like these, it is evident that the perfect state of the church here predicted is still in the future; consequently these gifts have not yet accomplished their end. This letter to the Ephesians was written in A. D. 64, about two years before Paul told Timothy that he was ready to be offered, and the time of his departure was at hand. The seeds of the apostasy were now germinating in the church; for Paul had said ten years before, in his second letter to the Thessalonians, “The mystery of iniquity doth already work.” 2 Thessalonians 2:7. Grievous wolves were now about to enter in, not sparing the flock. See Acts 20:29. The church was not then rising and advancing to that perfection in unity contemplated in the text, but was about to be torn by factions, and distracted by divisions. The apostle knew this; consequently he must have looked beyond the great apostasy, to the period of the gathering of the remnant of God�s people, when he said, “Till we all come into the unity of the faith.” Ephesians 4:13. Hence the gifts that were set in the church have not yet served out their time. 1 Thessalonians 5:19�21 says, “Quench not the Spirit. Despise not prophesyings. Prove all things; hold fast that which is good.” In this epistle, the apostle introduces the subject of the second coming of the Lord. He then describes the state of the unbelieving world at that time, saying, “Peace and safety,” when the day of the Lord is about to burst upon them, and sudden destruction come upon them as a thief in the night. See verses 3�4. He then exhorts the church, in view of these things, to keep awake, watch and be sober. See verses 5�8. Among the exhortations that follow are the words we have quoted, “Quench not the Spirit,” and so on. Some may think that these three verses are completely detached from each other in sense; but they have a natural connection in the order in which they stand. The person who quenches the Spirit will be left to despise prophesyings, which are the legitimate fruit of the Spirit. “I will pour out my Spirit, . . . and your sons and your daughters shall prophesy.” Joel 2:28. The expression, “Prove all things,” is limited to the subject of discourse�prophesyings�and we are to try the spirits by the tests which He has given us in His Word. Spiritual deceptions and false prophesyings abound at the present time; and doubtless this text has a special application here. But mark, the apostle does not say, Reject all things; but, Prove all things, hold fast that which is good. But the testimony of Jesus includes all the gifts of that one Spirit. Says Paul, “I thank my God always on your behalf, for the grace of God which is given you by Jesus Christ; that in every thing ye are enriched by him, in all utterance, and in all knowledge; even as the testimony of Christ was confirmed in you: so that ye come behind in no gift; waiting for the coming of our Lord Jesus Christ.” 1 Corinthians 1:4�7. The testimony of Christ was confirmed in the Corinthian church, and what was the result? They came behind in no gift. Are we not justified then in the conclusion that when the remnant are fully confirmed in the testimony of Jesus, they will come behind in no gift, waiting for the coming of our Lord Jesus Christ?